Now you can check out a few bonus clips for the classic musical hitting Blu-ray this week! As previously reported, 20th Century Fox is releasing 'West Side Story: 50th Anniversary Edition' on Blu-ray on November 15. The Blu-ray will be available in a Limited Edition 4-Disc Boxed Set featuring 2 disc Blu-ray, newly-restored DVD, Tribute CD and collectible memorabilia, as well as a 2-disc Collector’s Edition Blu-ray. Five decades after its historic debut, a timeless classic returns to dazzle audiences young and old. Based on the hit Broadway musical of the same name, the iconic film 'West Side Story' won a record-breaking ten Academy Awards® including Best Picture, Best Directing and Best Original Score, the film took home more awards than any other movie-musical in the history of cinema. This monumental production not only featured the timeless lyrics from master American composer Stephen Sondheim, but a brilliant score from Leonard Bernstein, and beautiful direction from Robert Wise. This “brilliant” (The New Republic) film sets the ageless story of Romeo and Juliet against a backdrop of gang warfare in 1950’s New York. A love affair is fated for tragedy amidst the vicious rivalry between two street gangs – the Jets and the Sharks. When Jets member Tony (Richard Beymer, 'The Longest Day') falls for Maria (Natalie Wood, 'Splendor in the Grass'), the sister of the Sharks leader, it’s more than these two warring gangs can handle. As mounting tensions rise, a battle to the death ensues and innocent blood is shed in a heartbreaking finale. 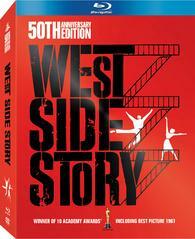 Featuring the famous songs “Maria,” “America,” “Tonight,” and “I Feel Pretty,” WEST SIDE STORY: 50th Anniversary Edition showcases thrilling performances by Best Supporting Actress® winner Rita Moreno ('The King and 'I), Best Supporting Actor® winner George Chakiris ('Two and Two Make Six') and Russ Tamblyn ('How the West Was Won'). The Blu-rays will feature 1080p video, a DTS-HD Master Audio 7.1 soundtrack, and supplements will include: ALL-NEW: Pow! The Dances of West Side Story – cast members, contemporary filmmakers, dancers and choreographers analyze and illuminate the film’s film’s famous dance sequences; ALL-NEW: A Place for Us: West Side Story’s Legacy – a look back at the iconic film and the impact it has had all over the world; Song Specific Commentary by Lyricist Stephen Sondheim; Music Machine – allows viewers to go straight to their favorite musical numbers; West Side Memories; Storyboard to Film Comparison Montage; and Trailers. You can find the latest specs for 'West Side Story: 50th Anniversary Edition' linked from our Blu-ray Release Schedule, where it's indexed under November 15.